This week we’ll look at the running backs who could be among the best in next year’s NFL draft. Running back is a position the Patriots will have to pay very close attention to next offseason. With two first round and second round picks, the position is likely to look a lot different next year. Of the six backs with the team currently (5 on the regular roster, 1 on the practice squad) only 1 do the Patriots control the rights of for next season an that is BenJarvus Green-Ellis. The rest will be free agents. At their ages, its probably unlikely Fred Taylor or Sammy Morris will be back. A lot can change over the course of a season, but right now it looks like Laurence Maroney is out of favor with the team. Kevin Faulk is seemingly ageless, but his contract is up and who knows how much longer he’ll play. You would assume if he remains effective this year and wants to continue, the Patriots will again have a one year contract waiting for him for next year, but at some point very soon they need to replace his skills as well. So lets take a look at who’ll be out there at this critical position for the Patriots next offseason. 1.) 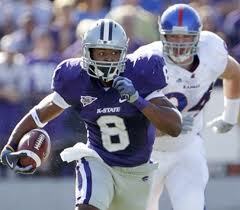 Daniel Thomas (#8) Kansas State: While its close, to me Thomas is the better pro prospect than Heisman winner Mark Ingram. Not that they’re not both great, they are. But Thomas has a rare combination of size, power and speed that is just a bit beyond that of Ingram. A former JUCO quarterback who Kansas State converted to running back, Thomas was the Big 12 Newcomer of the year last season. Alls he did was run for 1,265 yards and catch passes for 257 more. A big, powerful, bruising back in the mold of Steven Jackson, Thomas stands 6’2″ and checks in at 229 lbs. Given their needs at the position, the Patriots will undoubtedly take a long, hard look at Thomas with one of their first round picks in 2011. A great game to check Thomas out would be the nationally televised Thursday night game on ESPN at 7:30 PM EST on October 7th vs. Nebraska. 2.) Mark Ingram (#22), Alabama: Ingram is last year’s Heisman trophy winner who has struggled early this season with injuries. He recently underwent arthroscopic surgery on his knee and sat out last week’s opening win against San Jose State. He is questionable today against Penn State. Ingram is a fast, shifty back with good power. He seems to squeeze out yards after contact every time. He isn’t quite as fast or powerful as Thomas, but may be more elusive and natural in his running style. He is the son of former New York Giants wide receiver Mark Ingram who played on the Giants teams Bill Belichick coached with in the 1980’s. Of course he is also playing for Nick Saban who has a close friendship with Belichick as well. He is a sure fire 1st round pick and will also surely interest the Patriots. Check him out on October 2nd when he should be healthy versus Florida at home. The game will be shown on CBS at 8:00 PM EST. 3.) Evan Royster (#22), Penn State: Royster is another back with 1st round potential. A tall 6’1″ and 213, Royster relies more on speed, shiftyness and elusiveness in his game then power. He is excellent receiving passes out of the backfield. A homerun threat, Royster blossomed into a 1st team All-Big 10 player last year. He is not a great short yardage back, but is improving. Perhaps some slight bulking up to the 220s could improve his game in the NFL. Watch him do his thing on October 9 versus Illinois at Noon on either ESPN or ESPN2. 4.) DeMarco Murray (#7), Oklahoma: Murray split carries last season with Chris Brown and ran for 705 yards. An excellent receiver, he also caught 41 passes for an additional 522 yards. He has nearly 2,500 yards rushing for his career. This year he should be a bit more of a featured back. Whether he is or not, there is much to like about his game. His pass catching skills translate excellently into the NFL. He is reportedly very tough and a leader on the Oklahoma team. He handles blitz pickup well and he runs with a combination of power and speed when carrying the ball. He has a chance to be a 1st round pick as well and perhaps the most well-rounded back (so far) in the draft. Watch him on September 18th when Air Force visits at 3:30 PM EST on Fox Sports Net. 5.) Anthony Allen (#18), Georgia Tech: Allen is stepping into a starting role this season taking over for the departed Jonathan Dwyer who was a 6th round pick of the Pittsburgh Steelers himself. Allen is very similar in his game to Dwyer, checking in at 239 lbs. He may not be quite as powerful as the bruising Dwyer, but could be a bit faster and more elusive. He did get the chance to carry the ball 64 times last year and averaged an amazing 9.7 yards per carry for a total of 618 yards and 6 touchdowns. His pass catching is untested. The Georgia Tech option-oriented offense makes transition to an NFL offense difficult, but in Allen’s case he is a transfer there. He previously played at Louisville for two seasons (rushing for a total of 1,102 yards) who ran a more pro-oriented offense. So he does have some experience with it moreso than Dwyer did. It was thought that hurt Dwyer’s draft standing but shouldn’t be as much of an issue with Allen. Watch him do his thing as a feature back on November 4th when the Yellow Jackets travel to Virginia Tech on a Thursday night ESPN game at 7:30 PM EST. 6.) Brandon Saine (#3), Ohio State: Saine was a highly regarded running back who has had a slightly disappointing career at Ohio State. Still, he began to put things together finally last season running for 739 yards and 4 touchdowns. He also showed some pass catching ability. This year he’s looking to continue his progress and become one of the nation’s elite backs. He got off to a great start in week 1. He stands 6’1″ and 219 lbs. and has great speed as well. He hasn’t shown great elusiveness yet, but he is improving. Watch him today on ESPN at 3:40 PM EST when Miami (FLA) visits. 7.) John Clay (#32), Wisconsin: Another Big 10 back, Clay is typical Wisconsin. Big, powerful, bruising and not that elusive. Clay is only a junior and unlikely to come out after this season, but did run for 1,500 yards plus last year as a sophomore. He needs to work on his pass catching and pass receiving. He is powerful at 248 lbs. and will be drafted, how high depends on how much he can diversify his game by being more than just a power back. Watch him on October 9th which is Wisconsin’s homecoming game versus Minnesota. It’ll be on either ESPN or ESPN2 at Noon. 8.) Roy Helu (#10), Nebraska: A good, solid back Helu does nothing spectacularly. He produces, has good size, shows elusiveness and okay speed. Like many college backs, he could work on his pass catching but its decent. What he hasn’t done so far is dominate. He’ll undoubtedly get a chance in the NFL, how highly regarded he is while getting that chance depends on if he can go from a good to great runner this season. He can’t be 2nd team All-Big 12 again as a Senior and expect to be drafted high. He must dominate. Check him out on September 18th at Washington on either ABC or ESPN at 3:30 PM EST. 9.) Derrick Locke (#20), Kentucky: Locke is a very, very fast back who also is among the nation’s best kick returners. He is a bit small at 5’9″ 191 lbs. and may translate into a 3rd down back. He does have excellent hands. Very elusive, he is also a leader on the Kentucky team. While the Patriots are looking for running backs next year, including a possible need to replace third down back Kevin Faulk, Locke may deserve consideration. See him play versus September 25th at Florida, network and time to be determined. 10.) Noel Devine (#7), West Virginia: Devine is another small back who translates into a 3rd down NFL back. He has good hands, breakaway, burner speed and could possibly translate to a top-notch kick returner. What he isn’t is a NFL feature back, nor is he as explosive as last year’s similar back Dexter McCluster, who went in the 2nd round. He is probably a second day pick in the 4th or 5th round who could turn out to be a useful role player. He does truly have sprinter-type speed. He’ll play on a Friday night at Connecticut on October 29th at 8:00 PM on ESPN2. Hoping the Pats do take a long, hard look at Thomas and throw Locke in there as well. Looking forward to an overhaul of the RBs next year just like TEs this year.